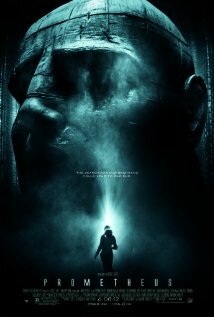 I’m a huge fan, so I’ve been waiting impatiently for Prometheus ever since I heard it was in the works. At last Ridley Scott, a guy who knows how to give us an original vision of the frightful future (Alien, Blade Runner, A Good Year), was going to sweep away the pretenders, the imitators, the arrivistes. Sorry, but Prometheus arrives on screens this week with a squishy and derivative thud. I mean, I felt as though I were watching a mash-up of Alien and 2001. Yes there are stunning alien vistas and the requisite heavy-duty hardware of space travel and the predictably surly bunch of crew members and of course the alien, or at least a variation of same. 1. First we’re told there are seventeen crew members, so we settle in to see them knocked off à la And Then There Were None. But it’s hard to care when only four or five of them have any real dialogue. The others are just faces that pop up every once in a while to make us wonder who they are. 2. Then there’s the theme. I don’t want to give too much away, so I’ll just say that it’s better suited to a Theology 101 essay. 3. Then there’s our old friend the exposition mule. Why do our intrepid space-hoppers conclude that, because they find human DNA on a distant planet, it means that the creatures found there must be our creators? Where’s the logic in that? And later the ship’s captain explains who the aliens are and what they’re doing—based on what? Nothing, that’s what. Just the screenwriters’ need to inject information. The movie’s long on mood, thin on plot. 4. I like all the actors. I just don’t think they’ve been given enough to do. And whose idea was it to give the excellent Idris Elba a southern drawl that makes him sound like the long lost cousin of Slim Pickens? Noomi Rapace, who was excellent in the original Girl movies (. . . with the Dragon Tattoo, . . . Who Played with Fire, . . . Who Kicked the Hornet’s Nest) plays frightened-woman-running, the role she played in Sherlock Holmes: Game of Shadows. She and Jennifer Lawrence are quickly earning the distinction for most-underutilized actor. It’s a shame. If any actor has the intensity to be a match for Sigourney Weaver’s Ripley, it’s Rapace, but when all she’s given to do is run away, it’s hard to think of her as heroic. Michael Fassbender is excellent as the robot, a character more nuanced than the any of the others, but too similar (even in his fate) to the character played so well by Ian Holm in the original. Charlize Theron seems to be recycling leftover meanness from Snow White and the Huntsmen. Her performance is all in her menacing glare, which would be fine if she had more to do with driving the story, like the Paul Reiser character in Aliens. 5. The movie’s too long. As writer Wallace Stegner used to say about some stories in fiction workshops, “This story’s got a lonnnggg front porch!” Cutting fifteen or twenty minutes from the first half might have done wonders for the movie. The Sleeper dropped off in the first half, and I gazed on her with envy. 6. The 3-D is pointless. One of the things—the only thing—that made Avatar interesting is Cameron’s ability to create the illusion of space, especially in the lab scenes. You feel as if you can step into the room and walk to the other end. In Prometheus the characters and objects seem to be layered on different spatial planes, but after your first moment of realization, you kind of take it for granted. Shouldn’t a movie based so heavily on spectacle provide us with, well, you know—spectacle? And has anyone else noticed that the layering of images in 3-D movies actually makes the individual objects and characters on each layer seem more two-dimensional? Yes there’s more depth to the overall image, but the object or character on an individual plane seems about as three-dimensional as a sheet of Mylar. 7. The movie’s derivative. Everything you see in the movie was done—and done better—in Alien. We’ve been there, done that. Yes, Prometheus has more visual polish, but that isn’t enough to make a movie compelling. Character and story matter more than spectacle. Alien changed the starscape for science-fiction movies forever. Since then, every other moviemaker in the genre has been playing catch-up. And now, instead of breaking new ground, Sir Ridley seems to be playing catch-up with himself. I’m the one. The one person in the movie-going world who didn’t see Paranormal Activity. I didn’t want to respond to the hype. And I wasn’t sure I wanted to see a movie that seemed to consist of nothing but grainy security-camera footage. And I was too scared. 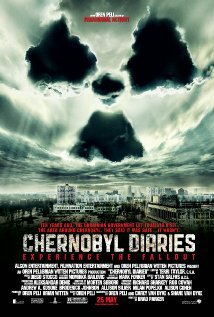 Now, from Oren Peli, the writer/producer who brought us Paranormal Activity, comes Chernobyl Diaries. I like the idea of the movie: a group of friends on a European tour decide to do some extreme tourism by visiting Chernobyl, site of the worst nuclear disaster in history. Or more accurately, they visit the bedroom community right next door. Isn’t the radiation still too bad for tourism? Sure, but they’ll be in and out in two hours. What could go wrong? And it will all go terribly, terribly wrong. But none of it—absolutely none of it—will scare you. And isn’t that the only point of a horror movie? The story starts with our band of bright-young-things living it up, visiting all the must-see vacation spots, going to parties, yucking it up. Then they go to Chernobyl, where, one-by-one, they will be dragged kicking and screaming into the darkness. That last part is a lot like how things look around my house every morning when I have to go to work. A movie like Chernobyl Diaries depends heavily on our imagination. We are often more frightened by what we can’t see than by what we can. This is Moviemaking 101. But you have to show us something. Unfortunately, the blurry glimpses of the irradiated residents of Chernobyl don’t trigger our imaginations. Instead, they make us think the budget must not have allowed for any creature effects. Isn’t there at least one surprising moment in the movie? I have to admit that, when our intrepid band hear a noise down the hall in an abandoned apartment, the source surprised me, but more the ha-ha-look-at-that kind of surprise than the get-me-outta-here kind of surprise. And I liked the faded look of the movie, as if the radiation had leached all the color out of the landscape and the very walls of the buildings. This is the last time . . .
I’m no good to you. You’ll move faster on your own. By the way, have you noticed the number of movies being shot in eastern Europe? This one looks like it was filmed on the same streets as the more inventive The Darkest Hour. If the camera were to move a few inches, I swear we’d see the other movie’s cast down the street, running from aliens. And we’d wish we were there.